Spiro capsule is a herbal blend of 6 rainforest botanical herbs. Spiro is a completely natural, herbal formula specifically created to help combat the action of harmful organisms and the resulting . There are many sources of exposure to harmful organisms and insect bites can be a significant factor. Spiro is a unique blend of natural ingredients which has been designed to help the body to counteract the effect of harmful organisms. This highly recommended formula is created from wildcrafted organic herbs and has been made to ensure optimum effectiveness. No need to suffer from the effects of harmful organisms. Thanks to Spiro your body can be cleansed of unwanted invasions for improved health. 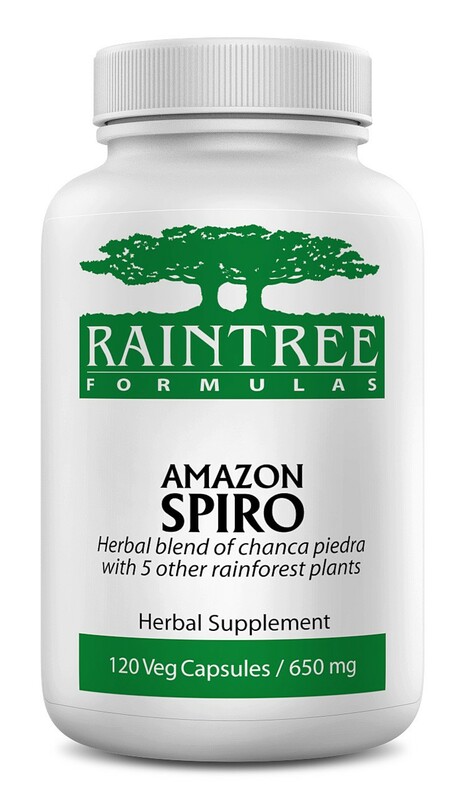 Raintree’s Spiro is formulated with the ideal balance of powerful botanicals, which have been used to support human health for centuries, in order to promote maximum results. Spiro helps to combat some the most significant effects occasionally caused by harmful organisms. The actions of such organisms can have a negative impact on the body which Spiro can harmlessly help to counteract. Many of the ingredients in Spiro have served the people of the Amazon rainforest well for centuries. The strength of this formula lies in its remarkable ingredients chanca piedra and bellaco caspi among others. Rainforest herbs may have a range of further health benefits, including a role in supporting the healthy functioning of the liver and kidneys. Enjoy all the benefits that this exceptional formula has to offer with no side effects. The wildcrafted ingredients in the Raintree Spiro formula have been selected to be of the highest possible quality. The formula contains absolutely no added ingredients, preservatives, fillers or flow agents, just pure herbs. Moreover, it is subject to strenuous quality control at every stage of its production. When harmful organisms proliferate throughout the body, they can negatively affect health and cause significant ailments. They can cause major damage to a person's body, including weakening your immune system. Rainforest botanicals have long been used to address a range of health issues, either as a sole single herb ingredient or in a formulation such as Spiro. Despite botanicals being used to support the bodies against harmful organism activity for thousands of years, many health practitioners remain unaware to their potential to ameliorate key conditions. What are the Benefits of Raintree’s Spiro? Supports the counteraction of key harmful organisms. Encourages your body's natural defences by speeding improvements in well-being. Has a role to play in supporting healthy liver and kidney function. May be used to help combat the negative actions of persistent organisms. Should you not be entirely satisfied with the results, please contact us and we’ll send you a prompt, no questions asked, refund. Formulated by experts using natural, specially selected rainforest herbs traditionally used to combat the results of the activity of harmful organisms. Potent formulation works with your body, but against some damaging effects of certain organisms by supporting your natural balance. Has a role in helping to support some of the key internal functions, such as helping to protect the liver and kidneys. Spiro is gluten free, contains no allergens, and no artificial ingredients. Packaged in a recyclable, UV-protectant bottle. This formula has been created in accordance with CGMP-certified production. What are the Top 3 Questions People Ask About Spiro? How do I know whether I need to combat the effect of harmful organisms? Naturally, our bodies contain millions of organisms of all kinds. Most are beneficial, but when harmful organisms invade our bodies we can experience unpleasant effects. These may include fatigue, occasional nerve discomfort, occasional muscle or joint discomfort, ‘bull’s eye’ skin and neck stiffness amongst others. Diet is often central to our health in an enormous number of ways. It is possible to follow a diet that reduces the instances of invasions by harmful organisms by enjoying organic fruit and vegetables which have a greater payload of nutrients and are chemical-free, thereby helping to support your immune system. Also, supplementing with an enzyme and probiotic can encourage enzymatic action and promote beneficial intestinal balance. How much Spiro should I take? Keep to footpaths and try to avoid long grass when out walking. Wear the appropriate clothing when hiking or hill-walking. Check your pets for infestations and take step to avoid them being transmitted. In addition, periodically perform a complete, full-body cleanse: Spiro may also be used with other natural, harmful organism cleansing products such as organic oregano oil or other products to provide a comprehensive spectrum of natural defences. Start Today - Discover How Spiro Can Help Combat Harmful Organisms…Or Your Money Back! 100% natural herbs as listed with no use of chemicals during cultivation. Vegetable capsule shell. Our formulas contain absolutely no other ingredients, no fillers, binders or flow agents. A herbal blend of chanca piedra, bellaco caspi, tamamuri, matico, huacapu, and ajos sacha.